" I had not expected the suffering. A night of racking anguish, sickness and fainting. I became insensible and woke languid in the darkness. I shall never forget that dawn, and the strange horror of seeing that my hands had become as clouded glass, and watching them grow clearer and thinner as the day went by. My limbs became glassy, the bones and arteries faded, vanished, and the little white nerves went last. At last only the dead tips of the fingernails remained, pallid and white. I went and stared at nothing in my shaving glass. 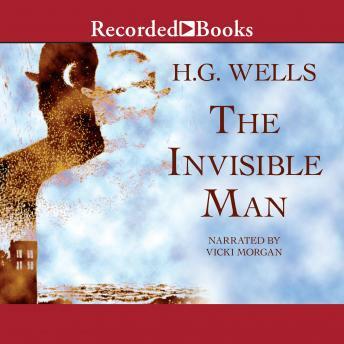 I had become an invisible man." Vicki Morgan' s entertaining narration of this science fiction classic is a great introduction to the fantastic world of H.G. Wells and the brilliant imagination, the psychological insight, and startlingly accurate scientific predictions that made him one of the most influential writers of his day.